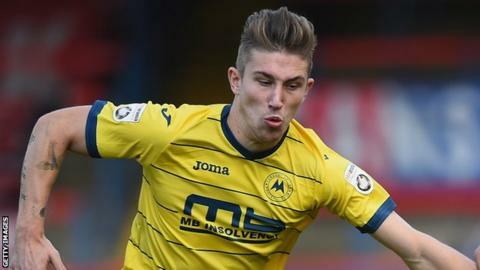 Torquay United captain Angus MacDonald has benefitted from player-manager Kevin Nicholson's decision not to play himself, says the Gulls boss. Nicholson has left himself out of the side for the last two games, both of which Torquay have won. "I've noticed from my captain that he's stepped forward and become the voice on the pitch," Nicholson told BBC Sport. "I've seen a lot more communication from him, and lot more geeing up of the players." Left-back Nicholson had been a fixture in the Gulls' defence since rejoining Torquay as manager at the end of September. "Maybe with me being on the pitch they all look and think 'he's the manager, he needs to do the talking'," added Nicholson. "With me being on the side, and no matter how loud I shout I can't hit the opposite side of the pitch, Gus has taken that mantle now as skipper and it's nice to see. "It's interesting being on the side - so far so good - but I enjoy playing so if I can work my way back in I'll try."